Buy (Order online) Ladies Special Monthly Magazine (Magasin) Now. Ladies Special Monthly Magazine prices are inclusive of shipping and handling through USPS. (for US deliveries). For other Countries shipping will be handled through their Postal Services (like Airmail in India). Address for delivery (Subscription) can be changed anytime. Please mail us the changed address details to info@magazinesemporium.com. 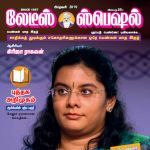 With the solid Tamil magazine “Ladies Special”, with continuous TV shows for women ,with thousands of stage events for women all over India and abroad, and with online readers of her website, Mrs.Girija Raghavan is very popular among women. Mrs. Girija Raghavan‘s passion is to unite worldwide Indian women. Women look upon to her for guidance, encouragement and help. Mrs.Girija Raghavan has taken Women Empowerment as her mission and a large army of committed ladies is with her. Since her television shows had a wide reach, with the continuous support of women, in 1997 she started a Tamil Monthly Magazine “Ladies Special”, as a women tamil monthly .Now, this magazine has readers around the world. The magazine has a readership of about one lakh all over India& abroad and has committed 10000 subscribers also. It is published online also in www.ladiesspecial.com. Since 1997,Girija Raghavan ,took a clear focus on women development and started producing programmes for women. . The magazine and the television programmes, gained more and more women strength for Girija Raghavan and she is adding all possible activities towards the growth of womanhood. She has taken entrepreneurship in women as her main focus and had been helping women who do business. Now she is helping them in marketing their products in several ways. She conducts programmes and exhibitions of the products of women entrepreneurs, all over India and also abroad.Government bodies assign her the responsibility of conducting exhibitions for their Self Help Groups. Government departments hire her services for studying and making reports on their schemes and in market promotions. Ladies Special maadha idhal Magazine subscriptions will commence either from current issue or from next coming issue. Ladies Special Monthly Tamil Magazine will be shipped immediately on getting the issues from the publisher. They are inclusive of Diwali and Annual issues. Any special issues will also be sent free.